It has come to the attention of Big Ag that the fastest growing sector of agriculture is organics. 2016 saw well over four million acres under organic cultivation. The total organic slice of the American food pie was over 35 billion dollars. You cannot boast that kind of success without attracting attention. Big Ag wants in, in a big way. Organic produce and products are, after all, significantly more expensive than “conventional,” chemically infused crops. It’s a “value added” product, without the trouble of adding value. In fact, these are high-end consumers who’ll pay more, but want less. Less chemicals, less guilt, and less health impacts from fertilizers and pesticides. Of course, there are a lot of pesky regulations related to organic certification. But American Business knows it way around regulations. Recently the industry group coordinating with government regulators, the National Organic Standards Board (NOSB), held its annual meeting. Not surprisingly, over the past decade the elected leadership of the group has been shifting towards large-scale, corporate producers, squeezing family farmers out of the mix. Organic products are regulated by the USDA, the agency in charge of enforcing our National Organic Program (NOP.) In decades past, nobody much cared about the definitional details of organic agriculture. The industry was the backwater of hippy back-to-the-earth folks. Conventional agriculture only cared that the program made production and certification expensive and burdensome—so it wouldn’t compete with their monoculture view of farming. In it’s early years, organic farmers debated earnestly just what “organic” meant. It’s not merely the absence of pesticides that defines the heart of “organic.” It’s about creating a food and commodities system that is sustainable, humane and healthy for both consumers and for the planet. During the 1980s, those same hippy farmers debated long and hard about what practices could be included under the organic umbrella, and what methods did not measure up to “sustainable.” The old organic mantra, “Feed the soil, not the plant,” spoke to a holistic approach to farming, and to the planet, in stark contrast to modern, industrial and extractive farming methods. Organic farming promoted crop rotation, natural soil enhancement, composting, non-chemical pest management, antibiotic and cage free animal husbandry and regenerating the environment through gentle agricultural practices. By any definition, organic farming should build soil and animal health—leaving us with a more diverse and stronger ecosystem. It is a moral and philosophical rejection of the chemically saturated monoculture and confined livestock systems that dominate American food production. Things went well, until organic became synonymous with money. The results of this year’s meeting illustrate where we’re headed. In the early days, when easing the burden for “transitional” farmers was important, some non-organic or synthetic practices were permitted, provisionally—to be “sunsetted” out of organic production within 5 years unless, by a margin of two thirds majority, the NOSB voted to reauthorize them. This year the Board voted that any 5 year exemption is automatically “rolled over,” unless the NOSB votes it down—creating a slippery slope of standards erosion. One of the big debates this year was whether hydroponic growing systems could be classified as organic. Really? How could a “farming” system that grows produce entirely without soil (often completely indoors), fed exclusively on a mix of liquid fertilizers and nutrients, wholly outside of any natural system be considered organic? What happened to “feed the soil?” What happened to organic farming acting in concert with nature to make the planet healthier? The Board couldn’t agree on the hydroponic issue, and has kicked it over to the next meeting, when there will be an even larger majority of corporate board members on the Board. Can you see where this leads? Just as troublesome is the failure of the USDA to enforce the standards of the National Organic Program. Large scale producers regularly break the rules, with no penalty from the government agency charged with protecting consumers. Small scale organic farmers are thus doubly burdened—with the high cost of certification, and then forced to compete in the marketplace by corporate farms that advertise organic, but don’t play by the rules. The little guys end up subsidizing the cheats. In the long run, failure to police the standards will only undermine the organic message—the cheats will kill the golden goose. Consumers, small scale organic farmers and the planet will pay the price. I don’t have a solution. I recommend that you support your local organic farmer through farmers’ markets, cooperatives or CSAs, that you start your own garden, keep bees or even chickens. I think we need to get involved, not just in the politics of food production but in some hands-on action, to protect our health and the health of our soils, our water and our planet. 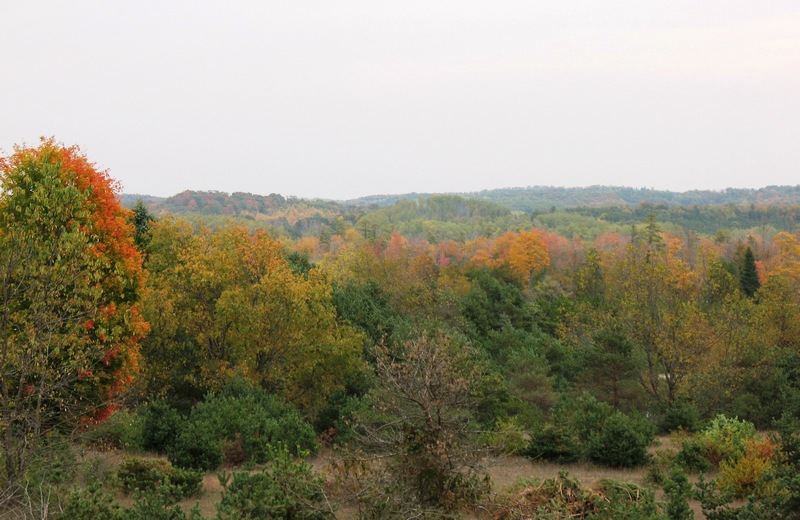 Two years ago, this week, Rick and I arrived in Leelanau. We’d loaded our truck at my brother’s on a clear, crisp autumn day. Not bothering to cover the load in such stellar weather, we then drove through three hours of mixed rain and snow, all the way to Empire. When we arrived at our little cottage rental, it was full of Ladybugs. When autumn gives you mixed weather—a clear warning of winter to come—she delivers it with a garnish of Ladybugs. On warmer days, they descend, lighting on any surface warmed by the sun. The air is full of them. They get into the house. If they’re pests, they’re cheerful pests. It’s difficult to work up any insect-phobic reaction to excessive Ladybugs. We’re rushing to complete some of the outdoor work before the weather turns. The air is full of Ladybugs, so we know well what’s on the way. Our work is not specifically gender determined. We each take on those tasks for which we have experience. Gender typing does ultimately play a factor—because our respective lives and experiences have formed us along such lines. Generally Rick does the heavy lifting. I have become the expert on surfaces, sanding and architectural coatings. Rick is stronger than me, and has more experience with heavy equipment. I am not afraid of heights. 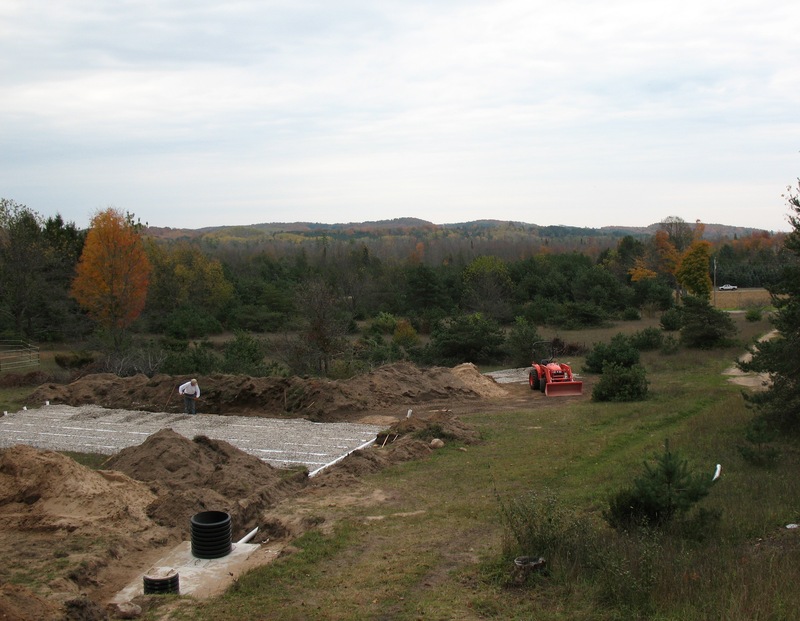 Rick is just finishing up the installation of the septic tank and field. That’s grueling work—digging, moving stone and sand. 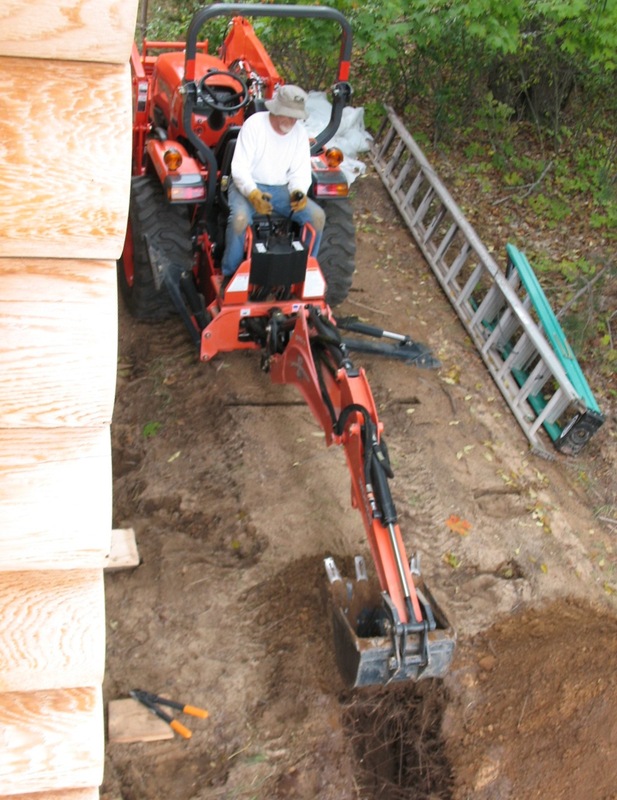 It would be impossible without the Kubota, but even with, there’s plenty of shovel work to leave you worn and sore by the end of each day. It looks wonderful, neat and crisp. He does good work (even the inspector said so.) It’s funny to put so much care into something that you immediately bury (and with any luck, you’ll never see again!) But a good septic system is imperative if you want to do your part in keeping surface waters clean. 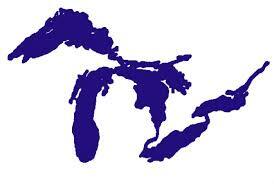 All water flows somewhere, and in this region, everything ultimately flows into our Great Lakes. Proper rural sewage treatment is not rocket science—but it is too often overlooked as a source of contamination. Rick is seeing to it that we are on the “part of the solution” side of the equation. Everyone likes the idea of clean water. However, whenever the state legislature, or local code authorities try to strengthen standards or enforce compliance with septic rules, the individual liberties and property rights folks go crazy. As though it were their personal right to pollute our collective drinking water. When you think of it, sewage treatment is a sort of litmus test for civilization. If you cannot figure out how to deal with your wastes—you’ll poison yourself in your own fetid soup. Not meeting that threshold, means you don’t merit the other percs of civilization. As a culture, we should reflect further on that starting point. I’ve just finished the exterior sealing of the log walls. First there was the inevitable prep—the critical step in any good home protection system. 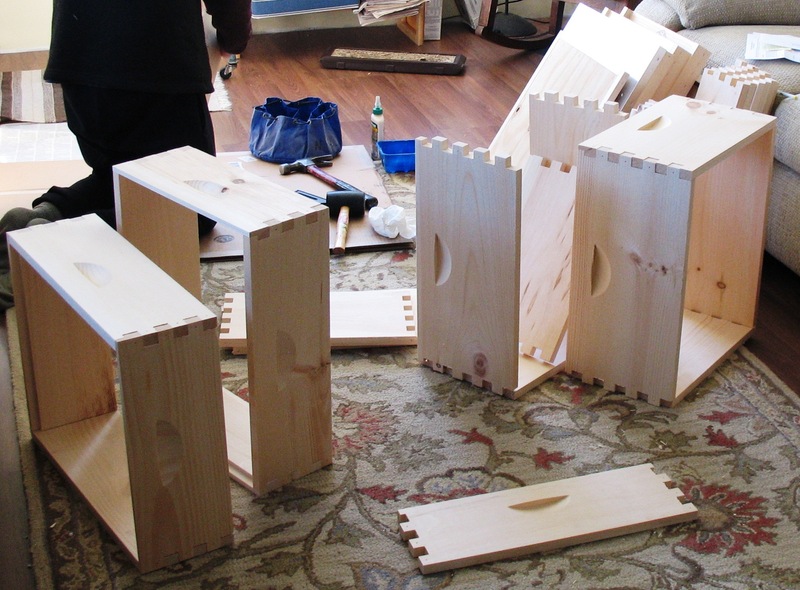 When paint or stain jobs fail, it’s almost always a failure in the prep process. If your prep doesn’t take twice as long as your actual application, you’re probably doing it wrong. Then, two coats of stain. This has been a stinky, messy, oil-based operation. I cringe at it, but it is necessary for the long term care of our home. I’ve painted several homes in my life, but this is my first initial staining of a raw wood exterior. Before I started, I did research. After two days of day-end skin cleaning, with solvents and abrasives, I figured out that I could start the day with my face and hands liberally slathered with a cheap, greasy lotion—to simplify clean-up and avoid the day-end toxic ritual. I must have looked a fright. I have “paint clothes” that I’ve used repeatedly over the years. They are more paint than fabric. To this I added a neckerchief over my hair, and one around my neck (daubed in herbal bug repellant.) And then I slicked that greasy layer over the skin of my face and hands. I was unrecognizable. By the end of each day, stain speckles on my glasses made me even weirder looking—and nearly blind. 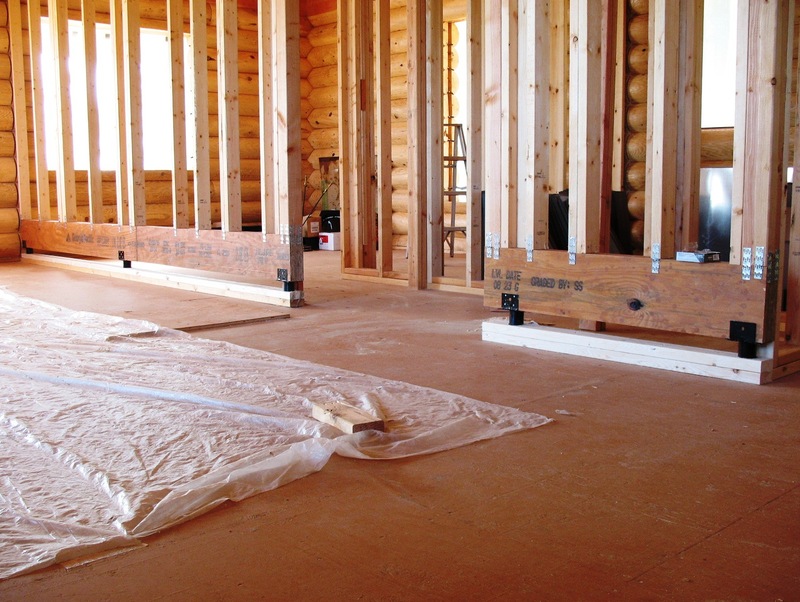 You can only apply paint or stain within a limited temperature range. Some days, it was just too cold for the materials. I really wanted to get the double coat onto the logs, so I could rest assured that the house was protected for the winter—and for winters to come. Make no mistake, winter is coming—the meaning behind the profusion of Ladybugs wasn’t lost on me. I found a good rock’n roll radio station (or, as good as it gets, in Northern Michigan) and, pumped up with oldies from my youth, powered on through. On logs, they recommend (especially for the first coat) that you apply the stain log-by-log, the full length of any given log, before moving on to the next log. Raw logs are so thirsty that if you don’t constantly work “from a wet edge” you’ll have forever-lap-marks on the logs. And, they told me to work from bottom to top. So that any drips can be brushed out. A stain drip on a naked log becomes a permanent feature. I didn’t argue. Even though this method maximizes the number of ladder moves, I stuck with it. And, I grew muscled with the wrestling of the ladders. My work on the last side, the north side, was confounded by the trenches Rick had dug for the septic—further complicating the ladder dance. (And, it would be the north face—the highest side of the house!) I was chugging along in my usual rhythm until I hit the north side. Then, maneuvering my ladders around the trenches I lost my nerve. I looked for it, high and low, but I could not get my nerve back. Maybe I was tired. Maybe stiff and sore legs wouldn’t respond as they should, and it made me feel awkward and uncomfortable on high. Maybe someone snuck kryptonite into my breakfast and suddenly, for the first time in my life, I was a mere mortal when working aloft. The farther up the ladder I went, the more cravenly rigid and jerky I became on the ladder. I was petrified. Only the sin of pride forced me back up there to finish that first coat (and then I vowed that I would not go back up until spring, or at least until the trenches were all filled.) I was firm in my fearful resolve, that is, until I saw the results of a second coat. Winter is coming. I have recovered my nerve. We have Ladybugs everywhere, and my hands have never been so soft. Oh, this project has tested us. It has been beset with delays, but I can’t complain. Each delay has brought hidden gifts. When last year we didn’t have time to put in a garden, we learned through the season that our initial garden spot was not a good place—not the best light and a bit too steep. That delay led to our current (now fenced) garden, which has great light and a gentle southern exposure, which will give us a little edge on spring. 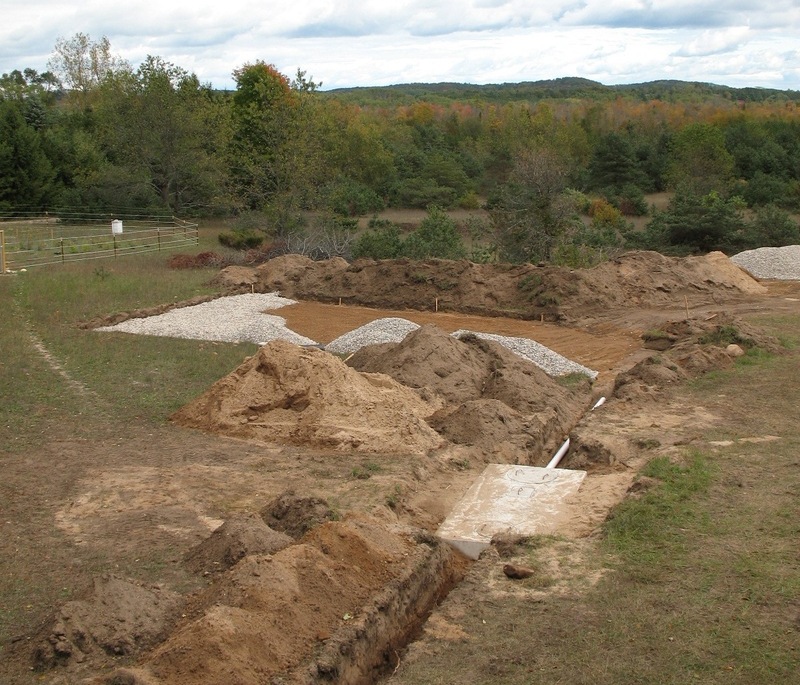 Likewise, our delays led to a reassessment on the best location for the septic system. Some of our delays have had an even longer fuse—and, perhaps, an even better payoff. 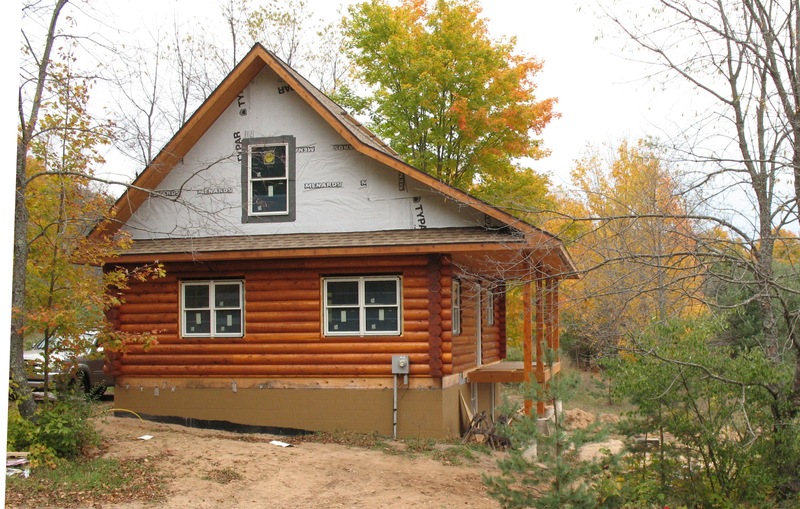 We selected the log cabin because we thought it would go up quick. 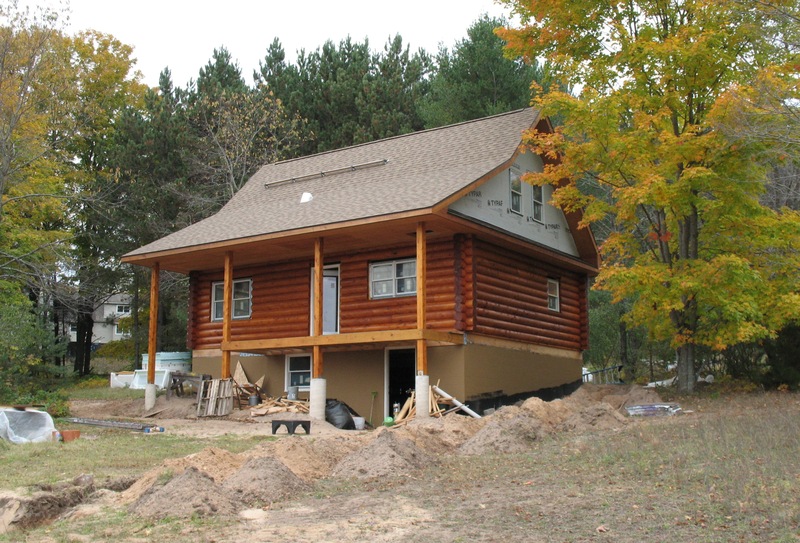 In the process, the guy selling it wanted to also push the “upgrades,” cedar logs instead of pine, the rustic railings and fancy split-log staircase. Mostly we were skeptical. Cedar, though, that seemed smart—cedar resists insect damage, much like the old growth redwood in California. Cedar fence posts last forever. So, when Bob told us that, unlike the pine, cedar logs were dimensionally stable, we listened. The railings and stairs were expensive and, well…ugly, falling into that category of over-rustic, or simply rustic for rustic’s sake. On those, we passed. Our cabin survived the winter, without any appreciable shrinkage. 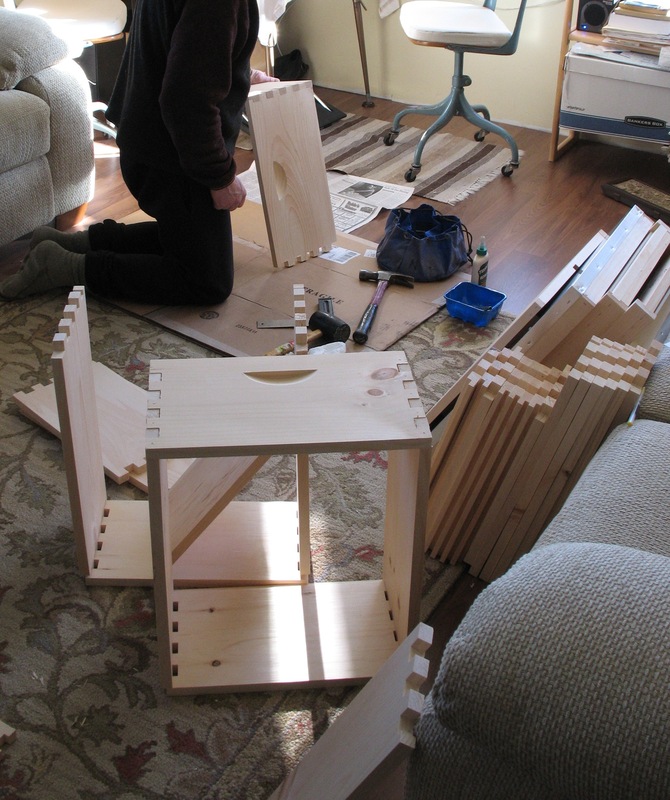 Rick built out the interior walls and the upper decking—then we wrapped and covered the whole thing until spring. The great unveiling revealed what we’d been led to expect—no real shrinkage. When the Flanagins arrived to do the roof they mentioned the jacks (again) and we showed them our absence of shrinkage. We reiterated what the seller, Bob, had said. They shook their heads and shrugged (again). Then the roof went on. The combined additional weight (from the roof) and exposure (now that it was unwrapped) resulted in what the Flanagins had expected all along. Accelerated shrinkage. 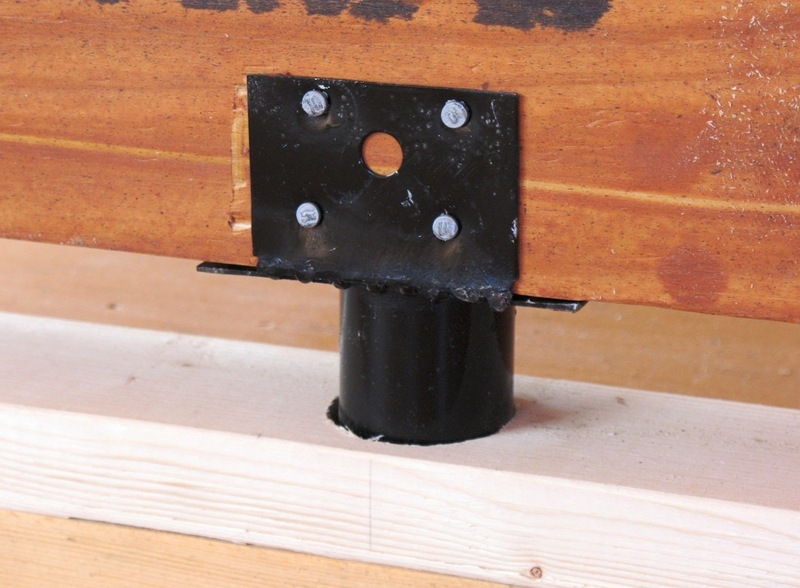 They measured the growing gaps at the exposed ends and predicted a total of 2 to 2 ½ inches of drop. That meant that our center, load-bearing wall (and thus the upstairs floor above) would end up that much higher than the exterior walls and floors—a veritable roller coaster of an upstairs floor, and potential buckled log walls. Not only that, but the extent of this movement endangers many other building systems—doors and windows, plumbing, wiring and ducting. Until this is resolved (either fixed, or until all the shrinkage is finished) one cannot continue the construction without risking future system failures. There is always shrinkage and warping in wood construction. We get that. We are not perfectionists. But, even before all the expected shrinkage has occurred, the end result in our kiln-dried cedar logs is not “immeasurable.” The only word that I know to describe what happened here, is fraud. 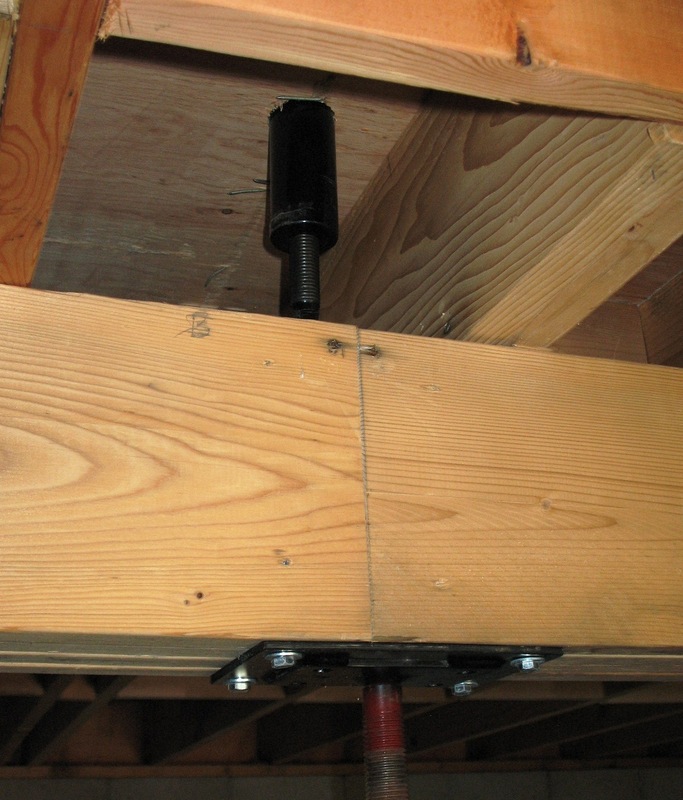 A retrofit is never as easy as doing something right the first time. It is beyond our abilities. So we’ve hired the Flanagins back again—to save us yet again. We had to wait again, for a window in their schedule, but we are blessed. This week they’ve re-supported our upper floor with temporary piers, cut out parts of the load-bearing walls, and installed the jacks. All of Rick’s interior framing will have to come out, or be cut shorter, to make way for the downward shrinkage. One step forward, two steps back. As soon as they finish we can really get going on finishing our home. It’s been trying, but our enthusiasm for the finish hasn’t waned. The question that hangs in the air is whether we “do something about it.” We feel that we’ve been saved from a bad outcome by the Flanagins (again). Solution in hand, we’re moving forward. But, are we rewarding bad behavior? Do we need to confront Bob with his misrepresentations? I, of course, am wracking my brain for what advantage was gained, by Bob…the proverbial why of it. I am chronically that third-grade kid, jaw dropped, because people are breaking the rules. What was he thinking? And, there, the solution nearly done. When I was little, there was no better escapade than when my brother would deign to include me on one of his adventures. Not that I was dull, but usually his idea of fun included trouble, maybe even… danger. The only time I was ever picked up by the cops, was with him. Not that he was a bad kid, he just had the ability to put normal, kid adventures together with opportunity, in his own unique way. He was the one who taught me how to “safely” jump off the roof—to scare my mother. She’d be parked on the couch, or doing dishes, and we’d launch off the roof from just above where she was—with a blood-curdling scream. It usually had the desired affect. One winter, Lake St. Clair froze over smooth. That is, the chill that froze its surface came when there was no wind, and it looked as though the whole lake was one big skating rink. My brother and I went out skating time after time, even on bitter cold days, to take advantage of that open, clear span of ice. On windy days, we’d sneak out towels, or even bed sheets, and skate like demons, upwind. We’d turn around, after what seemed like miles from our start, just before Pike Creek dumped into the lake and the ice thinned out. Then, we’d unfurl our makeshift sails, gripping tight to the corners, and ride the wind at breakneck speeds on skinny blades and wobbly ankles, all the way back to the public beach where we’d left our boots. Exhilarated, we’d roll up the sheets, tuck them under our coats and do it all again. After the second run, we noted a small crack in the ice. You couldn’t miss it, though it wasn’t big—only an inch or so wide. From time to time it spurted water as the lake’s smooth cover heaved in the wind. We got down on our knees to explore it, measuring the ice depth with our fingers; it was easily five or six inches thick. More than safe for skaters. But, each time we returned to that spot, we saw the crack had gotten wider. Our skating rink had become a huge slab of lake ice pushed by the increasing winds. My brother shrugged, seeing no need for this to get in the way of our fun. And fun it was, we skated till our toes were frozen and our cheeks were wind-burned and ruddy. On the returns, our wind filled sheets carried us, flying, bobble-kneed over the ice, as fast as ice-boats, or so my brother claimed. Our eyes streamed from the speed of it, a pace we’d never experienced under our own power. Our fingers would go numb, wrapped tightly around the corners of the sheets. Only the low slanting light of the short winter day convinced us it was time to wrap it up. But when we reached the crack, it wasn’t little anymore. It was now a yawning three-and-a-half-foot gap, with the frigid dark waters of Lake St. Clair lapping up over its edges. My jaw dropped as I turned and realized that our side of the ice was headed out, across the lake. “What do we do now?” I asked. After all, he was older; he would know. Though the ice was thick and solid enough, we both knew there’d be hell to pay if we had to be rescued from our floating island by the Coast Guard. He skated back some forty or fifty feet and, curled like a speed-skater, let fly. When he reached the edge he launched himself, horizontal, like a swimmer’s dive, landing on his belly, skidding and sliding on the safe side of the gap. I wasn’t so sure. I took several practice runs. I tried some small, test jumps. All the while, the gap was steadily growing. “Hurry up, it’s getting bigger!” He was standing safely on his side. And, he was right—every minute I waited, the jump would only get harder. I wanted to cry. I skated back to get a good run up to it and skated my fastest, pumping my legs nearly to the very edge before I finally jumped. But, I wasn’t horizontal enough. I was afraid to dive head first, so I flailed, legs peddling through the air. After what felt like forever, I hit the opposite edge, a little short. Landing on my knees, my lower legs slapped into the water, while the top of me hit the wet ice with a thump. True to his word, he grabbed me and dragged me away from the dark abyss. Without another word we hustled to the beach to change out of our skates and into boots for the walk home. Tying the last of his laces, he looked over, “We probably shouldn’t mention this when we get home.” Right, like he needed to say it. Rick and I moved to Michigan about eighteen months ago. It was a big jump, fueled by a number of issues. For a start, I already had property here and, I’m originally from here. We’d tried several times to buy in Sonoma, but our offers seemed to always be just behind the curve of the real estate recovery. Some properties we rejected because of water issues. The wells were either marginal, or contaminated. Mostly, though, we left California, because my mother was here. We pulled up stakes with a sigh of relief and we’ve continued on that momentum. My mum is thrilled. Back in California, there’s news that the state is on its last legs in water supply. A year’s worth left in the reservoirs they say, and the annual snow-pack needed to replenish them, at only 15% of normal. And still, they have yet to enact any serious or mandatory conservation measures. It’s as though Californians still expect the next miraculous rainfall to save them. There have always been droughts in California; they’ve always pulled through before, somehow. When we first arrived and people would ask why, I’d jokingly say, “Michigan has water.” Some of our friends think we left only for that reason—as though in the months and years before we actually did it, we had some secret knowledge about the worsening drought. Believe me, I’m no oracle. (Though, I didn’t need to be one to see that coming.) But I’m glad to be here. I grew up with Great Lakes and seasons, and it’s good to be home. I’m happy to have found a sense of place that fits me. Easy for me to say, but Rick seems to have settled in nicely, too. It’s what I wish for everyone—that they find that sense of place and comfort. I worry that, if nothing is done about our climate upheavals, many will be uprooted from the kind of comfort that knowing one’s way in geography brings. Maybe we’ll all suffer, when the place we know changes around us, bringing new challenges. What will Californians do, without water? What will become of the Sonoma county farms and vineyards? California, the state that fed the world–what will come of its desert agriculture? And, what about the emus we left behind? In my heart, I hope that everyone who loves where they are will stay right where they are. Stay and fight. We need enough of a commitment to place to make people adjust their ways to save it, and hopefully, in the process, save the planet. Some friends have asked me if I think things are really that bad. I’m afraid that the science says yes, and our species refuses to accept that answer. They’ve asked me to tell them when to bail; when to max-out on their California real estate and escape with top dollar in their pockets. As if I knew. And, as if that very attitude isn’t what dooms us to start with—the concept of disposable landscapes. Stay. Fight. Change. Make it better.